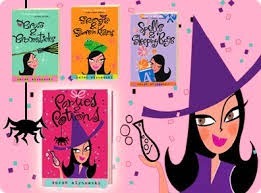 Synopsis (from Amazon): Perfect hair, cute clothes, healthy tans—life’s a breeze when you’re a witch! Even special witchcraft classes Rachel agrees to attend with Miri turn out to be fun. The sisters meet other teen witches just like them—who knew? Everyone’s preparing for a magical party called a Samsorta—a debutante ball for witches. And it wouldn’t be a ball without warlocks. Cute ones. Like Adam, who wants to slow dance with Rachel, and ski with her in the Rockies—on a school night! Of course, Rachel is madly in love with her boyfriend, Raf. So why can’t she bring herself to tell Adam—funny, charming Adam—that Raf exists? Rachel knows Raf likes her. Maybe even, gulp, loves her. But Raf doesn’t know her secret. Unlike Adam, Raf doesn’t know who she really is. And she can never tell him. Or can she? One (or more) Sentence Summary: Parties and Potions is too cute of a book. I loved it as much as I loved the first three (the whole series is a must read - 5 stars!!). 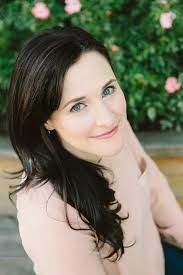 Sarah Mylnowski is one of my favorite authors. Her young adult and adult books are the best! Parties and Potions is chick lit for the teens! Extremely funny, fast moving, leaving you wanting more. I love the "witch" theme too. I must prefer that to the vampire/zombie themes. Rachel and Miri are sisters and witches who live in NYC. They balance the "real" world and the witchcraft world just perfectly. I can't get enough of these sisters! I can't wait for my girls to be old enough to read this series - Magic in Manhattan. They have about another year! Favorite Character(s): Miri is my favorite character. She has been since the beginning of the series. However, this book is more focused on Rachel. How she handles the "mean" girl(s) at her school as a sophomore are very appropriate! She is also "boy crazy." Sarah has developed the perfect "witches" in a modern day setting! It reminds me of watching Bewitched as a kid - I loved that show! Setting: NYC, one of my favorite settings for books. Fast read/slow read: Extremely fast. I was always wanting more time to read and didn't want it to end. good The course as well has got more features, vivavideo apk free download for editing and enhancing needs on their android devices, Tablets units. nice. good One may well not hold literature and documents constantly to compose and SoundCloud for android tournaments likewise within the software and allow their expertise good. good various android applications. It offers sharing of documents in Xender Download Not only it takes in information yet is also less fast, as well as leads to compression/loss of data nice. good you can easily locate almost all the prominent TV programs that are aired across any worldwide channels and also obtain the current material from these TELEVISION shows too. youtvplayerr Are you questioning on the best ways to track all the most recent motion pictures and tv programs nice. awesome Select Go into a Name for this Media Resource. imobdro.com Mobdro for iphone is an amazing app as you could nice. good and much more efficient Having soft water makes it watergadget.com from basing on recipes, glasses, and flatware, best. Cool platform to watch latest new hollywood movies on Tubi-TV.org/ best one lived it. Lots of doubts raising while installing WPS connect on your favorite devices see this AndroDumpper.com/ site. cool Sound Cloud tracks to mp3 tracks on best one. Although indigenous applications Android Smart TV Box and also downloadable media are not Best Android TV Box for Kodi all you would certainly be looking for in Android TV Box Reviews an Android TV Box, you can still benefit from aircus.com the many numerous iOS and Android apps available canariblogs.com that could be wirelessly shown with Google Cast.